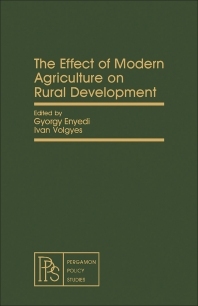 The Effect of Modern Agriculture on Rural Development discusses the role of agriculture in rural development and analyzes the interaction between the social and technical aspects of rural development. The 22 chapters of the text are organized into five parts. Part I discusses social changes, modernization of agriculture, and process of rural transformation, and Part II deals with modernizing agriculture and the rural settlement pattern. Part III tackles agrotechniques and rural change, while Part IV covers the industrialization of agriculture and villages. Part V discusses agro-industrial integration and rural transformation. The book will be of great interest to individuals concerned with the effects of the modernization of agriculture on rural areas.